Sili: Er... perhaps better bɔn anivɛʁsɛːʁ. The use of the term "post free" is also interesting. 8 bob in Great Britain, but 8s 6d abroad. Looks like overseas customers were being charged a tanner for postage - hardly "post free". And I'd have said "eit n siks" rather than "eit n sikspəns"
We had one at the Lund lab, I don't know if it survived the move to a new building 10 years ago. "Post free" might have meant something like "free on board", the seller will see it's delivered to the post office and see that postal charges are paid, then it becomes the property and responsibility of the buyer. Atkinson charged overseas buyers 6d more for that service. That's not my memory of post free. I always took it to mean We won't charge for posting on top of this. In this case, if you were an overseas recipient, sixpence was a nominal charge — not to cover the actual cost of your postage. It was your contribution to the total cost of postage to all overseas recipients at the many and various rates that then prevailed. The OED3 defines post-free adv. as "Without payment for postage, free of postal charge (either officially, or through prepayment)." I take the last three words to mean that the price quoted may be inclusive of postage charges. Here's an interesting quotation: "1885 Amer. Jrnl. Philol. 6 360 The price too is moderate, being eight marks in the book-stores, but to members of the Gesellschaft the volume is sent for six marks, post-free." 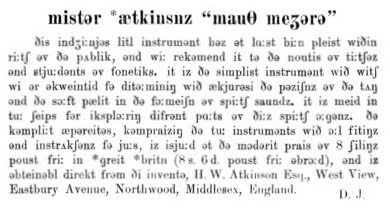 The use of (8s 6d) seems to reflect a general attitude that 'phonetics' was just another way of writing. The 'writer' of the advert had earlier written ʃiliŋs (with an interesting choice of vowel symbol). He or she didn't write eit, however. Perhaps Mr Atkinson insisted on the price information being proof against misreading by phonetical novices. Similarly the 'writer' of the notice represented the starting date of the lectures as 10 ɔktɔbr. Another interesting insistence deference to written convention is *greit *britn to mark capitalisation. Yes, John, but a uniform charge of 6p for delivery to Paris or Valdivostok would not include actual postal charges -- but rather an estimated average cost to the sender. The asterisk convention was very generally used at that time. * may be prefixed when it is desired to show that a word is a proper name. I can't imagine what happened with anivasɛːʁ, but what seems to have happened with anivɛʁsɛːʁ is that you have gone along with the antediluvian length mark, which is at least more synchronically phonetic there than in most of its other appearances in the graphics. 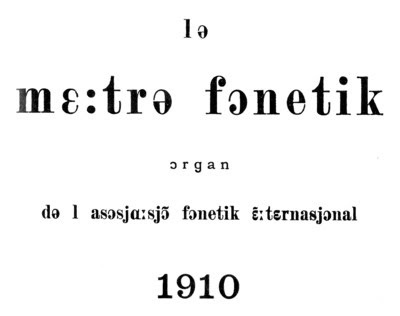 Interesting to see round dots on the journal title, but the triangular ones on the subtitle. Does anyone know where the convention of using the triangular marks comes from? Was this just a typographical variant of that time which gradually came to be recognized as the IPA form? In fact, does the IPA recognize round dots and triangular ones as both being okay? I like the accent implied by sɔːft. I had an elderly relative who used to speak this way, and would also say kɔːf for cough. Heh. Thanks. That's what I get for trying autodidactism. what kind of accent would (or do) you use for an article there today, if it were still in phonetic transcription? Would you try and represent yours as true as possible, including any traits you might consider no longer mainstream? Which would you recommend a non-RP speaker to use? I would represent my own speech, but selecting the stylistic variants I would teach to EFL students: e.g. for two o'clock my more deliberate ˈtuː ə ˈklɒk rather than my usual casual-style smoothed ˈtʊəˈklɒk.